NOTE: Enhancement is currently a work-in-progress. Comments & suggestions welcome. Multi-server deploys of October have issues with syncing CMS content (pages, static pages, content, etc) between the multiple instances of the application servers. This would be solved by allowing that content to be managed in the database, enabling the use of a central DB server to act as the source of truth. Managing developer updates to the theme files can be handled through the use of the theme:sync command. Projects that are actively touched by both developers and end users have issues with content getting out sync where the production server has content entered by the client and there are template / theming changes made by the developer. This would enable the client's content to remain untouched in the DB layer while the developer still has the ability to selectively refresh specified files after they've been modified by the client. Content is currently tied directly to individual theme directories, this makes tasks like sharing content between themes and multi-tenant applications that rely on CMS content very difficult to achieve by default. Moving CMS content files into the DB will simplify these tasks for plugin developers, although this is still not a full implementation / resolution for either of those cases. As content is currently represented as flat files and has no presence in the DB, this makes certain extensions quite difficult to achieve (such as adding fileupload, relation, recordfinder, etc fields to CMS objects). This is a step in the right direction for supporting those features however is not a full solution to those issues. There are also some issues with search performance on larger sites that heavily utilize CMS content, this will be alleviated somewhat by having the ability to store and search that content in the DB. Progressive: This enhancement will be fully progressive, i.e. existing installations and new installations will continue to use the filesystem datasource by default; only those instances that choose to enable cms.enableDatabaseLayer and have a database already will see this feature set. Templative? : This enhancement will change the role of the filesystem to that of a base template to fall back on when content is not present in the DB layer. All creates, updates, and deletes will be performed on the DB layer when this is enabled, the filesystem will remain untouched (excluding the use of theme:sync with the --target=filesystem flag). Performant: Performance is a top priority. As such, CMS objects that are available in the DB will be cached as such, and objects that have been explicitly removed from the site will be cached as such in the cache layer and the DB layer. Extensible: Feature will be extensible with the initial focus on events being supporting multi-tenant usage. Add theme:sync themedir --paths=path/to/specific/file/to/sync.md,path/to/other/file.md --target=filesystem, defaulting to the current theme, all paths in themedir for the --paths flag and database for the target flag. Replaces all paths specified in the target with contents from the source. 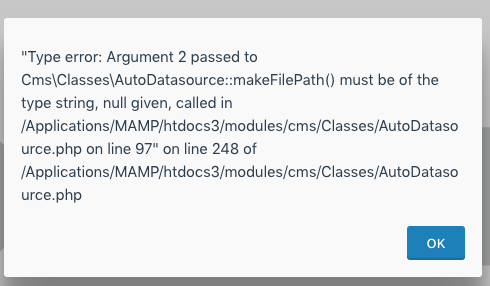 If no paths specified will empty the target entirely before populating with source files. Add Reset button to CMS & RainLab.StaticPages. Appears when DB & FS copy exists, removes the DB version therefore populating content from the FS. Add Commit button to CMS & RainLab.StaticPages. Appears when app.debug enabled (meant only for developers) & DB content exists, populates the FS version and then removes the DB version from the DB for performance. DB layer can be described as the client, filesystem as dev. If the client has said "I don't want home.htm" then that will be true forever. (such records will be marked as deleted in the DB layer and then cached as a removed item in the AutoDatasource). Dev can delete and replace as much as they want, it won't change that fact that the client doesn't want that object. If the client later inserts that file again into the DB layer through the CMS then the existing flagged record will simply be unflagged and populated with new content. Switch the main branch to wip/halcyon-db-datasource (ex: git checkout wip/halcyon-db-datasource). Set cms.enableDatabaseLayer to true in /config/cms.php. Run composer update to install dependencies. Run php artisan october:env to generate an .env file (from project root). Input your local DB connection info in the .env file. In /plugins/rainlab/pages (create folder if it doesn't exist), clone the repo for the rainlab/pages plugin. Switch the plugin's branch to wip/halcyon-db-datasource (ex: git checkout wip/halcyon-db-datasource). In /vendor/october/rain, remove the existing contents and clone the repo for the october/library package. Switch the package's branch to wip/halcyon-db-datasource (ex: git checkout wip/halcyon-db-datasource). Run php artisan october:up (from project root) to install the local RainLab.Pages plugin from the cloned repo. I'm available to test the progression of this PR if you need me. For reference, this plugin approached the same idea I believe (adding tables and intercepting saves towards DB instead of filesystem with the ability of pointing back to FS). Since you're at the CMS/Framework level you can definitely make this a lot more "invisible", which is very nice. Properly remove deleted paths from results returned by AutoDatasource->select() and utilize the cache exclusively when only selecting the fileName column preventing calls to the source datasources. @osmanzeki it should be ready enough to test with just CMS content. RainLab.Pages isn't playing nicely with it right now (for some reason it's only listing the first available page and ignores deleted layouts, not to mention some data is stored with direct filesystem writes instead of through the datasource abstraction). @seanthepottingshed @ayumihamsaki @w20k @Teranode Would you guys be willing to help test this out as it's worked on? @LukeTowers I would absolutely love to! Excellent, I will have a play with it this week. Thanks, I'll tag along and start testing on this week. Busy month all of a sudden. The file is populated directly from the PageList class, triggered after create and delete actions on the individual page records. Implement a CmsObject that stores and retrieves data in the YAML format and switch the RainLab.Pages plugin to use that CmsObject type instead of accessing the file directly. I haven't forgotten about this - big site launch this week which I've been helping my colleague with, will have a play thereafter. I haven't forgotten this either, i've just been preoccupied with my own project since i just started getting into Vue. Just ping me if you need me to do something. When you make a commit or reset. Buttons (reset/commit) will be hidden from UI nav-bar. Reset button should be hidden only if you don't have any changes in DB. SideNote: Might be a good idea to make two buttons: 'save' & 'save and commit'. Doesn't work with newly added items. Go to Pages tab -> Press 'Add New' static page or Menu. @bennothommo @mjauvin could you guys test this out? This is intentional behaviour, if the file is committed or reset, then the version of the file in both the database and the filesystem is now identical. The difference between the two buttons is which version of the file is used to make the sync, reset means the filesystem version is used, commit means the database version is used. As the file is now identical in both the DB and the filesystem, it cannot be synced again, as that would be pointless. Hence, both the commit and reset buttons disappear. @LukeTowers I've given this a quick test through with just the CMS pages area for now. Works really well, but I could not see the "Commit" and "Reset" buttons in the CMS pages area until I made the changes above that I've suggested in the reviews. Static Pages is working well as well. Just suggested a fix for the issue spotted by @w20k above. Awesome! @w20k could you run another test on this? @bennothommo Do you have any input on the theme:sync command? I think where I left off I was struggling to figure out the best way to determine what datasource paths should be mirrored when no explicit paths are provided given that the available datasource paths returned by a datasource (specifically the filesystem) could include binary files that don't necessarily have a Halycon object to handle them, in which case we would want to ignore them. With each of these folders, you would just need to limit the files scanned and synchronised to files with the htm(l), yaml, txt or json extensions (and possibly check the MIME type of each file to make sure it appears to be what its extension claims it to be). Anything else could likely be safely ignored, for example, any assets or files that are explicitly text-based. Is there any examples of content that exist outside of these folders that you would also want to be synchronised? @bennothommo I've been thinking about having an event that allows you to include paths / extensions to be listened to. Core shouldn't know about static-pages, and default extensions could be htm, yaml, txt, md, and potentially others if provided by an external plugin. @bennothommo good idea, and then the event can process that as default input allowing it to be added to or removed from. Do you think you could take a stab at implementing that on this branch? @LukeTowers sure thing, will try have a crack at it in the next day or 2. @LukeTowers what was your main concern(s) in regards to the code you already have implemented that retrieves and filters the source paths? Looking over it, I think it might actually make more sense continuing with your implementation, as the CmsObjects already define the directories and valid extensions, and the filter you have in place is already stripping out any other paths (ie. assets). Hmm, not sure exactly. Perhaps you could take a stab at finishing it off and then we'll see where that gets us? @bennothommo looks pretty good! I've added a comment to it, then it can be merged and we can test it out!